Tabletop games and video games have long held special places in the hearts of gamers, but for most of their lifespans, these two formats were inherently separate. 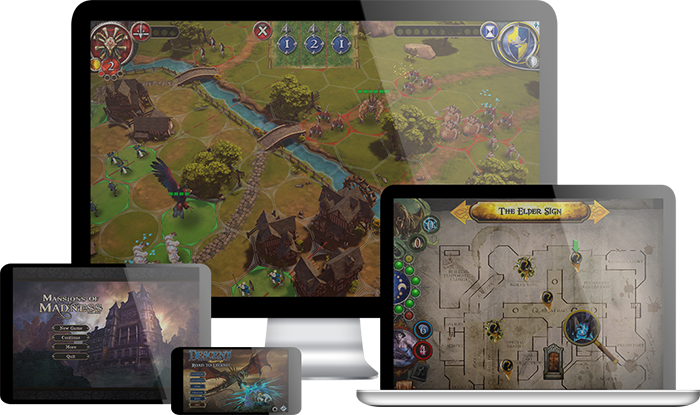 In recent years, however, Fantasy Flight Games has led the tabletop industry in bridging the divide between tabletop and video, creating app versions of tabletop games and app-enhanced board games. To get a closer look at this new style of gaming, we sat down with Keith Hurley, Fantasy Flight Games’s VP of Media and Interactive, to talk about the electronic side of board gaming. FFG: How did Fantasy Flight Games first start making apps? Keith Hurley: Christian Petersen, our CEO, first approached me about apps when Warhammer Fantasy Roleplay 3rd Edition was in development. This was in 2009, so FFG didn’t have an in-house software development team yet. Chris had put together a design document for a dice rolling utility, specifically for use with the WFRP 3rd Edition system. It called for a 3D mobile dice roller that could provide quick results with large pools of dice. We knew a little bit about the Unity game engine, which is the platform we now use to develop all of our apps, but no one had any real working experience with Unity at the time. All we knew for sure was that it was an increasingly popular development engine that had a lot of cross-platform flexibility. Eventually Chris got in contact with a software developer, Francesco Moggia, who was living and working in Italy. Francesco had an extensive programming background and was familiar with Unity, so he began development remotely while I worked internally with our designers to put the project together. 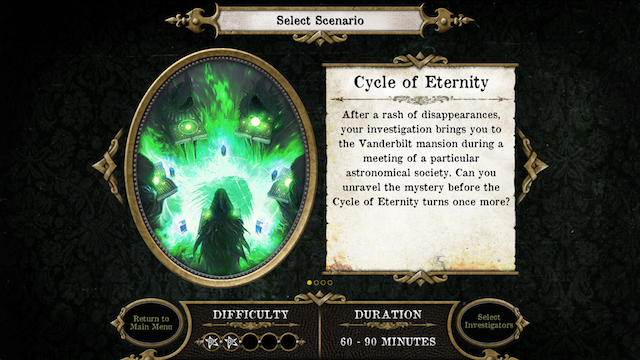 We ultimately launched the app in 2010 and followed that with the Arkham Horror Toolkit, Hey, That’s My Fish!, Elder Sign: Omens, Star Wars™: Dice, XCOM: The Board Game, BattleLore: Command, and now our Road to Legend and Mansions of Madness companion apps. FFG: What’s the best part about creating an app? KH: My favorite part of app development is probably Sprint Review, where we show the work that we’ve accomplished over a given period of time. This usually involves showing our working app up on a big screen in front of the whole team of developers and designers. It’s often a great high-five moment for everyone, where we get to see how a concept has gone from inception to a fully interactive product. Anything that needs additional work is critiqued and planned for the next review, so it’s a continuing cycle of feedback and improvement until we get it to a point where everyone is satisfied. It’s really rewarding to see how all of the different elements of app development evolve into a finished product. FFG: On a similar note, what’s the hardest part about creating an app? KH: Testing! Testing multi-platform apps gets harder every year as more devices and more operating systems come and go. We have a pretty small team of developers and external testers and it’s incredibly difficult for us to test every possible combination of device and operating system. The fragmentation in the Android market alone is a significant challenge—last I checked there were over 24,000 unique Android devices!—so we focus our efforts on the ones that have the largest market share. Also, as our apps grow more complex, as with Road to Legend and Mansions of Madness, the volume of narrative content that needs to be tested becomes an increasingly large ocean of variables that need review. This testing is not only for game balance and fun, but technical testing as well to ensure that events and activations are firing correctly. Road to Legend, as an example, has about forty-five products in its Collection Manager, all with unique digital content, and they each need to be tested alone and in conjunction with each other. 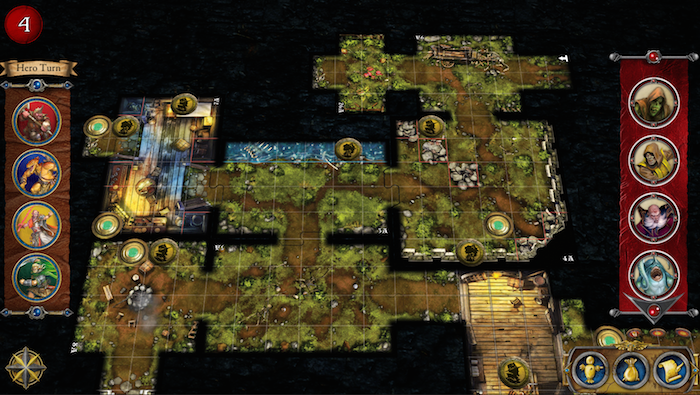 FFG: What are some of the advantages of using an app to enhance a board game? KH: One great advantage is that a companion app gives us the opportunity to use all kinds of audio and visual content to support our narratives. 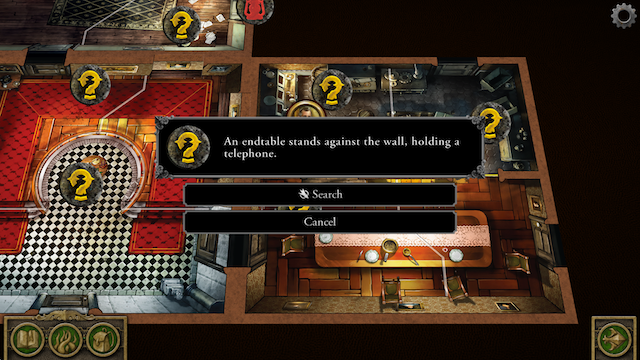 In both Mansions of Madness and Road to Legend, for example, all the music, sound effects, narrations, and cutscenes work to develop an atmosphere for the players. When you launch a scenario in either app, we try hard to set the stage, whether you’re investigating a rash of disappearances in a sleepy coastal town or tracking down a mage in the depths of some long-forgotten dungeon. Additionally, apps allow our content developers to rapidly produce more content using the tools that we’ve developed. When we have a vision for a new scenario, a physical component is no longer a requirement for expansion material. In Road to Legend, for example, we can easily push out new side quests with a simple app update. FFG: How is designing an app version of an existing game, like BattleLore, different from designing an app that works with a board game, such as Mansions of Madness? KH: BattleLore: Command was a unique challenge in that we had to take an already established game and re-envision it for mobile devices. This meant having to take a dice system and reinterpret ways it could work during combat, in addition to coming up with alternatives for lore powers or unit abilities that didn’t easily fit in a digital format. The tabletop version of BattleLore has a lot of opportunities for players to interrupt each other during gameplay, and we really wanted to streamline the combat for our mobile version. This meant changing a lot of the abilities and some core mechanics in the digital version of the game. A game like Mansions of Madness, on the other hand, had no interpretation work because everything was designed with an app in mind from day one. FFG: How do you decide what to draw from the original game when creating an app version, such as Elder Sign: Omens or BattleLore: Command? KH: A lot of it really just has to do with ease of implementation. Elder Sign had two major challenges for us when we were designing the digital version: 1) how to use the Ally Deck, and 2) how to resolve the Ancient One battle. Ultimately we made the decision to cut those elements from the digital game as our prototype was already very fun and challenging without those elements. 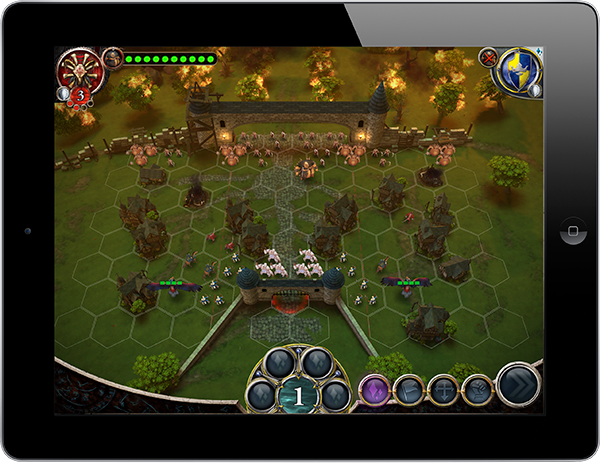 BattleLore: Command had many challenges with the combat system, in that the original game is a two-player, head-to-head combat game where each player can interrupt the other player’s turn at many points during gameplay. That element alone was something we knew we wanted to streamline for the digital version, and that decision ultimately had a domino effect on many other elements. Things like lore powers, unit abilities, and even the combat system needed to change in order to streamline the experience. FFG: Can we expect to see more app versions of games and games that harness apps in the future? KH: Yes! We have several exciting plans for future apps that we’re eager to develop. 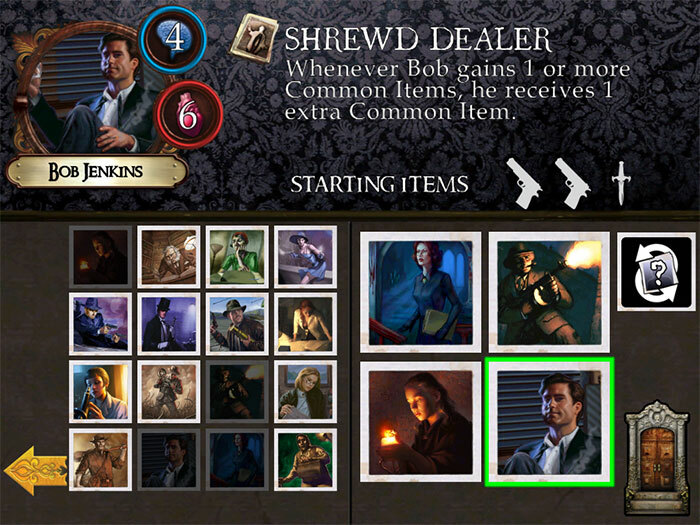 That said, companion app gaming is really just one tool in FFG’s toolbox. We’ll never completely replace traditional tabletop gaming, nor do we want to. It is however, a really exciting time for software developers, and our ability to create powerful, thematic content through apps is something where we’ve only begun to scratch the surface. Check out some of the great apps from Fantasy Flight Games, including the Arkham Horror Toolkit, Hey, That’s My Fish!, Elder Sign: Omens, Star Wars™: Dice, XCOM: The Board Game, BattleLore: Command, and the Road to Legend and Mansions of Madness companion apps.